Governor Hickenlooper’s cowardly decision yesterday to save mass murderer Nathan Dunlap’s life via executive order has been met with a furious reaction across Colorado. Most furious were the victims’ families, who have been waiting 20 years for justice. Reactions from the families of those slain during the Chuck E. Cheese’s killings were as intense as they were different after Gov. John Hickenlooper announced he would halt the execution of Nathan Dunlap. “The knife that’s been in my back … was just twisted by the governor,” said Bob Crowell on Wednesday after a conference call with Hickenlooper. 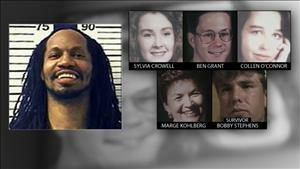 Crowell’s daughter, Sylvia, was among the four killed by Dunlap in December 1993 after the ex-employee hid in a bathroom until the children’s restaurant closed, then shot the five people working. Hickenlooper contacted the families before his official announcement of an open-ended reprieve for Dunlap, 39, just three months before his scheduled execution in August. DENVER (CBS4) – Gov. John Hickenlooper indefinitely delayed the execution of convicted killer Nathan Dunlap on Wednesday and CBS4’s Jennifer Brice was with the parents of one victim when the governor had a private conference call with the families. Brice was sitting in Bob Crowell’s kitchen with him as he was on phone with the governor. His daughter was killed by Dunlap at a Chuck E. Cheese 20 years ago. just goes to show what politicians will do to get a name. Hickenlooper is so wrong and has no feelings. infuriating! might have spelled that wrong but you get my meaning! Hickenlooper needs to be reminded that if you lie with scum, you wake up smelling like scum. Proof positive that liberalism is a mental disorder. How can you reconcile killing unborn babies while sparring the life of a murderer. Chickenlooper and all libtards need to go.